Craft brewery specializing in suggestively named ales & stout, with a wood-paneled taproom & tours. 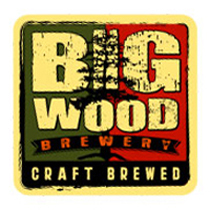 Big Wood Brewery has won several awards, including Best Beer (City Pages, Autumn Brew Review, Rochester Craft Beer Expo) and Best Brewery (Summer Beer Dabbler, Winter Carnival, Autumn Brew Review). The brewery produces three year-round beers, Morning Wood (coffee stout), Jack Savage (American pale ale), and Bark Bit (IPA). They also have four randomly brewed, limited edition beers, Wicked Ex (IPA), Amigo Grande (Mexican-style lager), Bad Axe (Imperial IPA), and Fine! (IPA). Perhaps best of all, they make a series of taproom-only beers, some of which are year-round, while others are seasonal.